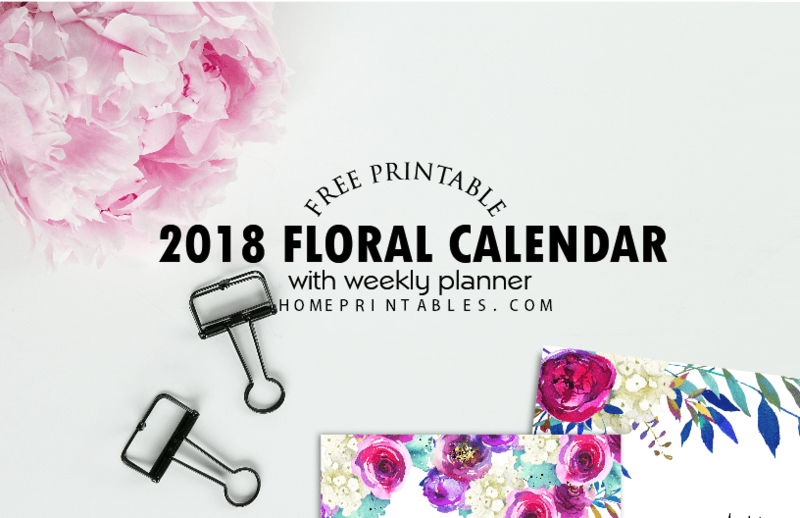 Free Printable Calendar 2018 in Beautiful Florals! I’m oh so excited to share with you this free printable calendar 2018! It comes in irresistible florals that are truly beautiful. So friends, be ready to plan your 2018 in style– you are about to print our prettiest calendar ever! Looking around for your printable calendar 2018? I am giddy in excitement to present to you this amazing floral calendar set. Each calendar comes gloriously beautiful! I am beyond thrilled to show them to you! But before I give you the links to the download files, allow me to Welcome you to Home Printables, your new home for free pretty printables online. If you haven’t explored the site yet, know that it’s loaded with planners and organizers that you can get all for free! So if you love to plan or if you’re thinking of finally starting to get organized, I think you’ll be happy to have landed on the blog. I have hundreds of printable organizers for you! Today’s freebie is a special one, I must say. I have created an amazing set of floral printable calendar 2018 that you can print and use immediately! Not only that, it also comes with a free weekly planner that you can grab for free! Speaking of the calendars that I am sharing away today, they come in bold and dazzling florals with unique arrangements for the different months of the year. Yup, they’re that amazing! Wondering how you can use these free printable calendar 2018 best? Well, they’re created to help you organize your life! Use them to plan ahead your daily schedules at work and at home. You can also use them for meal planning, blogging and more! And oh, if you’re a momma who would like to have a complete household binder handy, go checkout this latest product in our shelf the ULTIMATE PLANNER FOR MOMS featuring 70+ printables to help you run motherhood blissfully! Let me show you a closer preview to some of the calendar pages. As I have said earlier, this is our prettiest calendar ever! I mean look at the design. It’s SO amazingly beautiful. I mean, look at that playful florals. What’s also nice about these calendars is that they don’t consume your printer ink that much. Aside from the floral design, the calendar comes in plain white background. You will also have a good room to write on your reminders for each day! Would you like to see some calendar designs for the rest of the year? Here are my favorite styles from this set. I especially love the free printable 2018 calendar for April! 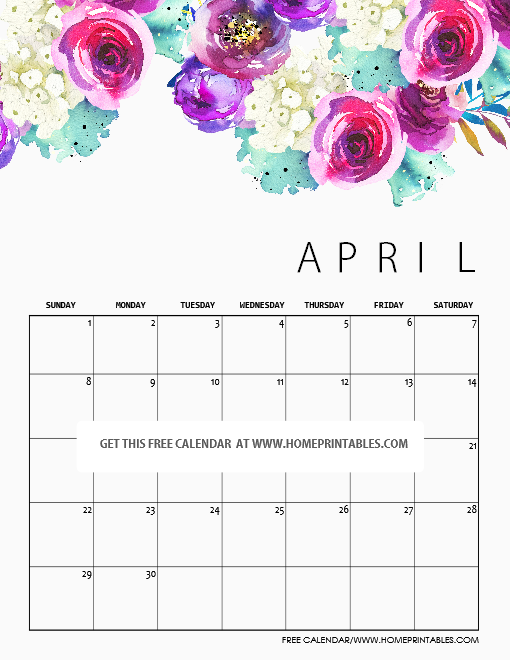 Free printable April 2018 calendar! 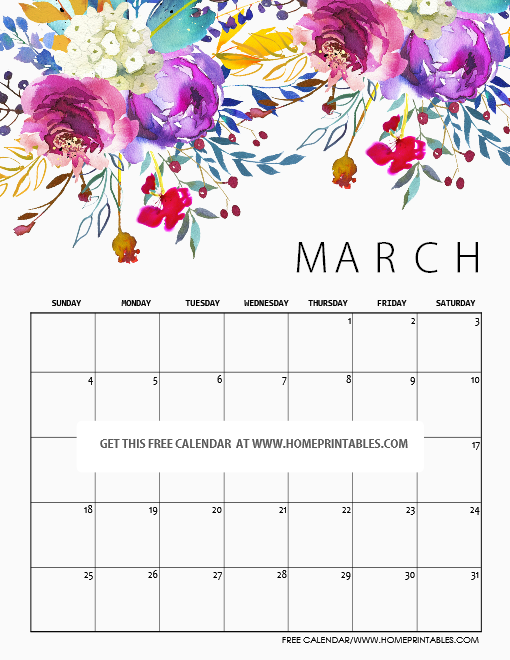 Free printable March 2018 calendar! How do you like the designs so far? They’re pretty and charming, right? Won’t these planners inspire you to plan your 2018 ahead? You can view the designs for the other months of the year in your download. They’re definitely free for personal use. Thanks to OctopusArtis for the amazing floral elements I incorporated in the design (you can also get them for your future projects)! Excited to finally have your copy of these calendars? What are you waiting for? Hop over HERE to grab your printable 2018 calendar! The weekly planner is also included in the file. Just print them in standard 8.5″ X 11″ paper and be sure to check your printer setting before printing, Okay? There’s also one more planner that I’d like to introduce to you, friends: The 2018 Success Designer. If you’re loving this free printable 2018 calendar, I am pretty sure you’ll love this new planner, too! A little heads up here though: It’s not your ordinary 2018 life planner. It’s the kind of planner that is designed to help you plan your success by helping you narrow down your goals into every day action plans. See the planner yourself HERE. It has over 70 pages of organizing goodness for you to use! 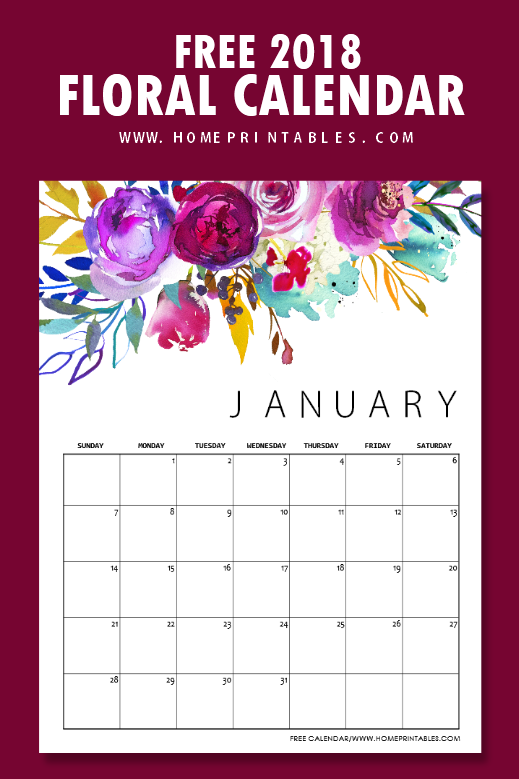 PIN THIS FREE PRINTABLE CALENDAR 2018 ON PINTEREST! Do you love this free printable 2018 calendar set? If you do, I hope you can spare a second to help me grow Home Printables blog by pinning us on Pinterest! Your every pin means a lot to the Home Printables family! Not only that, you are also able to save the post for your future use! Pin the image below on Pinterest! One last thing! Please day “Hi” at the Comments if you’re planning to use this free printable calendar 2018 set. I like to hear from my readers so I get motivated to create more! Have a beautiful 2018, friends! Plan your year in style with Home Printable’s stylish planners. See you around! Hi, these are gorgeous. I plan on printing them in mini sizes and posting them on my cube wall at work. Thank you so much for your design. I love that these aren’t just floral, but artsy floral if you know what I mean. Thanks for your kind words, Tricia! Enjoy the calendars! Thanks, Izzy! Plwease enjoy the calendars! sooo gorgeous! Thank you for sharing! I will enjoy looking at this everyday! Thank you, Kathy! I’m happy you love it! Love the water colour feel – and that they are light on ink but still beautiful! Hi Love these dark rich water colour florals – stunning design. Is it perhaps also available in landscape? Not at the moment. If I’ll receive at least 10 requests, I probably will create this version of the calendar in landscape. Thanks! Your designs are STUNNING! Please continue to grace our cubbies, offices and homes with your beautiful calendars. Happy 2018! Beautiful florals! Inspiration to keep me drawing throughout the year. Thank you so much – these are absolutely beautiful! hi, thank you for the free printable calendars. they are indeed the prettiest florals! i will be using them as a wedding guest book (at the reception registration) this april 2018. Wow! I am happy to hear that. Thank you! Beautiful calendar pages. I LOVE the floral colors! Thank you for sharing your talents with us. Hi! Thanks so much I love the floral designs! Wow. love your floral calendar. Gonna use it well. thanks a lot. “HI” I am so excited to try these pretty AND FREE printable calendars! Thank you!!! I’ll use this classy calendar for the remaining of this year! These are some great printable monthly calendar. I really like the floral print. Hi! Thank you so much! Your designs are so pretty and beautiful. Hi, I love the floral with bible verses. For some reason, I cannot print them out without the line that cuts out the third week. I can’t seem to access the full page monthly calendar. Can you help? These are beautiful.